If you chose A or C, I apologize for your confusion. Charlotte began horseback riding lessons this summer. She’d been asking to learn and I was excited that she could train with my friend Kit, trainer extraordinaire and proprietor of Blue Sky Farms at Brighton Farms. I loved riding as a kid. Still do. And I am thrilled to share this sport with Charlotte. In the past month, I’ve realized that I’m doing a lot more than sharing a childhood interest and sport with her. Horseback riding augments her Occupational Therapy in many important ways. It also provides an interesting corollary to and framework for thinking about parenting. Horseback riding requires core strength, including a strong shoulder girdle, awareness of how energy in the body flows from the core to the extremities, and a sense of where your body is in space. When she’s grooming the horse, Charlotte has to squat to brush his legs, and she has to hold one hoof while she picks it clean using the opposite hand. None of this comes easy to Charlotte. Riding also requires motor-planning, something she works on in OT, and dexterous hands. Finally, while Charlotte is not truly challenged with regards to self-regulation, she has been having issues with it lately. What does this mean, or how does it translate? She loses her temper easily, mostly when she is frustrated (by a grown up telling her she can’t do something), and she has started giving up when something is difficult. Neither frustration nor giving up work when you’re learning to ride a horse. She is endlessly frustrated that she’s only allowed to ride at a walk right now, but she has to take a deep breath and stick with it until her trainer allows her to go to the next level. For a kid who thinks she’s an “expert” at something once she’s tried it a few times, this is really difficult. 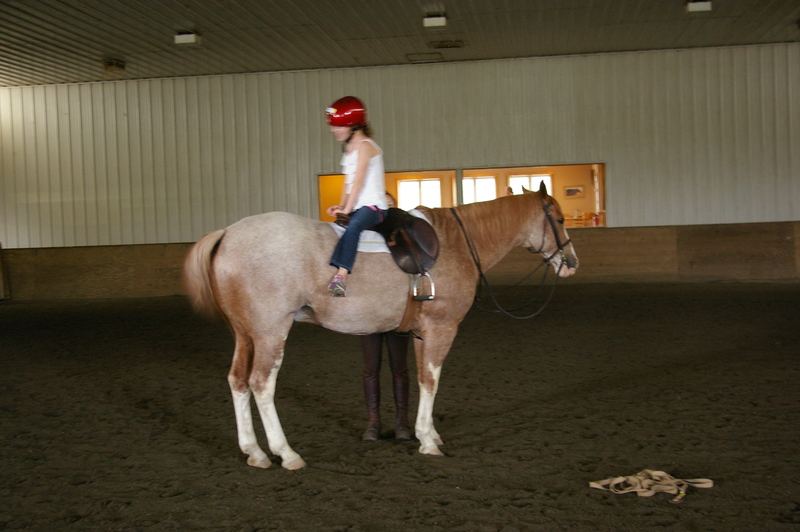 I get now why hippotherapy is so helpful for kids with JRA, MS, or autism. For all the same reasons why riding is great for any child, really. On the parenting front, Kit reminds me often that I need to exercise patience because the horse is just testing me. “Like other people in your life,” she’ll wink. She tells me go easy on the rein and use my leg, so that he’ll go in the direction of my hand and away from my leg. “You have to make him think that turning/starting/stopping/changing gait is his idea, but make sure he’s doing it because you want him to. Just like with Charlotte,” she’ll say. Or, “Be patient, some days are just harder than others.” Or, “Give him some rein, he’s been working really hard.” And so on. Sometimes I’m amazed that she hasn’t written a parenting book with her sage horsey advice. Now, why is Charlotte facing the wrong way on the horse, you ask, if this Kit is such a good trainer? Because Kit is a phenomenal trainer–the “around the world” exercise trains Charlotte’s core muscles (and not just because she’s giggling), and teaches her to trust Kit and the horse. Just wait til Kit sends her off at a trot. Backwards! Categories: Occupational therapy | Tags: Equestrian, Occupational Therapy | Permalink. 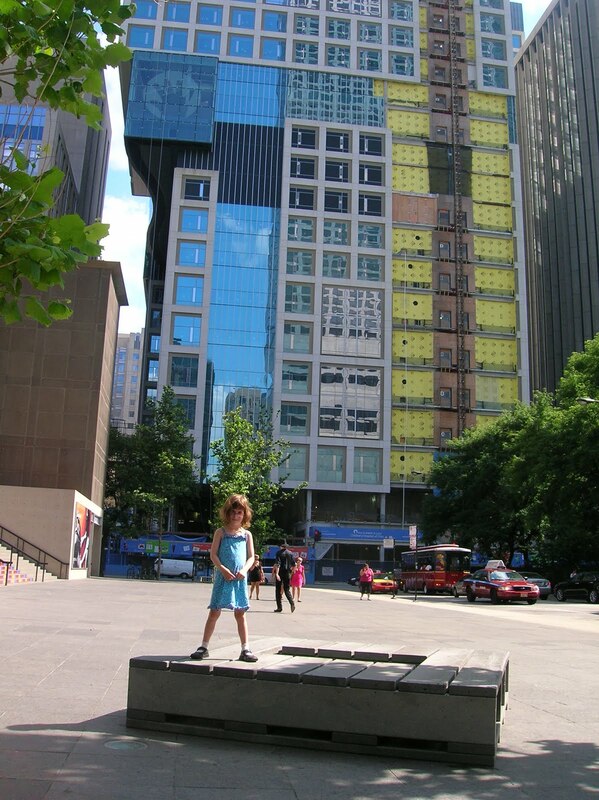 Charlotte posing in front of the new Ann and Robert H. Lurie Children’s Hospital of Chicago. Construction is on schedule. At this critical juncture we still need funds–the building is up, but we need to complete the interior. Please click here to donate and be a Hero for Life. And check out the hand etched into the windows at about the 8th floor, screen left. After nearly 8 months of research, evaluations, and hair pulling (mine, really), we were ready to find an Occupational Therapist. The evaluating practice was out of the question so I, once again, turned to Team Charlotte. Since Amy Zier & Associates was not an option because of insurance and the recommended OT at Children’s Memorial was on maternity leave (very inconvenient timing), I turned to Oaktree Developmental Center. Its lead OT, Kathleen Stanton, was recommended by Cheryl Mercado, the OT who evaluated Charlotte during her years in Early Intervention. My first conversations with Kathleen were very calming–she is familiar with both therapies that had been recommended, was willing to set us up based on the BO&A evaluation, and clearly wasn’t planning on jumping to conclusions about anything until she (or the assigned therapist) had met Charlotte. Charlotte was happy with any clinic we might find as long as there was a ball pit. 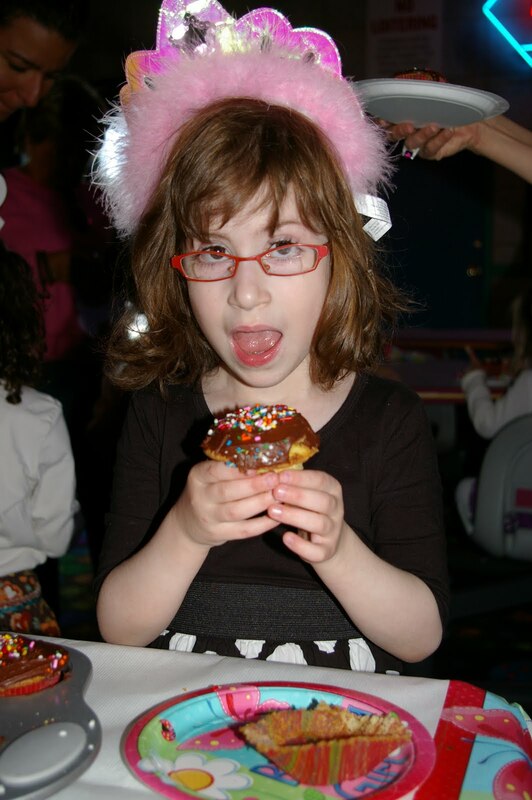 Finally, in early March we were matched with Sarah S., an OT fresh out of school with a wonderful way with children. Charlotte dove right in. Literally, she dove right into the ball pit. While it is clear to me that she still needs work with fine motor strength and skills, her willingness to try new physical challenges was already (in March) vastly different than it had been when we first begin this odyssey in June, 2009. After 4 weeks, we could already see the difference in Charlotte’s upper body strength and daredevilness. She looked forward to therapy as a big playdate with a new grown up friend. Then…while on a brief vacation during our March break, we received a call from Kathleen to let us know that Sarah had had to suddenly resign. [Family reasons. Not mine to tell, but I will say that she is not only an amazing young OT, but that she is clearly a wonderful daughter and niece.] Because Oaktree is so small, Kathleen couldn’t schedule Charlotte with an OT until she hired someone new. The morning before the appointment, I called Kathleen to see if, on the off chance, she’d hired anyone. She said, “I was about to call you. I can start you with my new OT on June 6,” and proceeded to tell me all about Jill. A) Beginning quickly with a new OT, new facility with a break in continuity. Big bonus, lessening the weeks of no OT. Big minus, Charlotte would just get used to her new OT and then have a sub. Oh, and no ball pit. B) Waiting about five weeks to return, but going back to a known facility (with a ball pit) and continuous service with the same OT. We choice option B. The OT on whom I cancelled (I can’t remember her name, but would dig through my notes if we need to go through this again) sent me a very supportive email saying that choosing the known facility and continuous OT would likely be less disruptive for Charlotte. She thought it made perfect sense, promised to shred all our intake documents, and told me to get in touch if I needed to. So, Charlotte’s been playing with Miss Jill at Oaktree Development Center every Monday since June 6. The changes in Charlotte are evident and exciting. She’s working on balance, core strength (serious ab work, folks), fine motor strength, and complex task sequences. She starts and ends each session in the….ball pit! But, she’s riding a zip line to jump/fall into it. She is so excited to go to OT, that she doesn’t say goodbye when she runs into the room. That, folks, is the end of the OT/DT Odyssey tale. It began with a surprising and shocking comment by an astute, sensitive teacher. Charlotte travelled through junior kindergarten with a master teacher who nurtured her and helped her blossom. We discovered her intellectual strengths, physical deficits, and potential challenges. Charlotte went to camp and became a sort of daredevil (more on that another time). And she goes to OT weekly to lessen (or at least learn to manage) the discrepancy between her fine motor skills and intellectual capabilities. Categories: Oaktree Developmental Center, Occupational therapy | Permalink. Charlotte debuting as a special guest at the Saving tiny Hearts Society gala last month. Saving tiny Hearts was founded by a couple whose son has complex CHD and who recognized the need for research into the #1 birth defect in the U.S.
By the end of February we had ample evidence to know that Charlotte needs Occupational Therapy. Her “deficits” aren’t visible to the average observer, but they could impair her academic achievement later. Finding a reputable OT practice that accepted our insurance was a bit more challenging. We had decided not to return to BO&A for a variety of reasons. Our next search was for a practice that would accept our insurance, offer Therapeutic Listening, and understand Floortime Therapy. Loving art at the Museum of Contemporary Art in Chicago. Upon seeing this sculpture by Nathan Carter, inspired by Alexander Calder (one of my favorite sculptors), Charlotte squealed, “Wow.” and began to look for all the letters in it. The exhibit, on Calder’s influence on contemporary artists is titled “Form, Balance, Joy.” We totally got the joy! First, however, we had to understand a bit of what each is. listen, we listen with the whole body. The therapy involves listening to sounds (music, sort of) on headsets while doing everyday activities, this therapy can begin in an OT session and be continued at home. It would help Charlotte’s balance and, perhaps, catch her up on some development that she may have missed in utero or by being in hospital for the first 49 days of her life. Given Elizabeth Benney’s (Developmental Therapist) diagnosis of “vestibular instability,” and the resultant probably issues regarding posture; shoulder girdle weakness; inability to isolate gross motor movements; intense reactions to loud and sudden noises; and some fine motor weaknesses, Therapeutic Listening seemed an approach that could help Charlotte. Floortime was a bit more difficult. My initial research led me to the website of the Interdisciplinary Council on Developmental and Learning Disabilities. 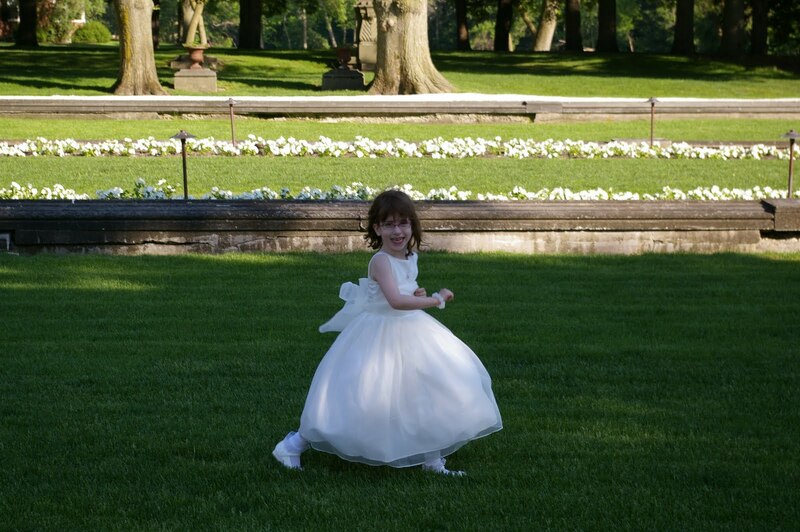 Immediately, my warning bells started ringing—Charlotte has no disability diagnosis. In fact, Dr. London (at Rush Neurobehavioral) had talked about figuring out which of diagnosis code to use for insurance since there was no diagnosis of learning or behavioral disability or neuropsych problem. I am not in denial, folks. There isn’t a diagnosis. I can’t quite as easily provide a simple, direct explanation of the DIR Floortime Model created by Dr. Stanley Greenspan. It is based on Development, Individual differences, Relationship-based approach to each individual child. Reading the website, I got a headache from the warning bells. But, I take professional advice seriously. And, despite the fact that I felt that the practice that recommended Floortime might be working the up sell pretty hard, I looked for ways to learn more. This led me to Amy Zier and Associates. Amy Zier is an Occupation Therapist in Chicago who is certified in Floortime. While her practice in Chicago is not contracted to our insurance, she responded quickly to my inquiries and we were able to attend a small seminar she hosted to educate parents. If you are curious, follow this link to learn more about the six developmental milestones. Philippe and I were fascinated, especially as we recognized our own areas of deficit. The therapy itself is intense. It requires parent and child time with the OT as well as six hours (more or less) of daily at-home therapy. For us, the bottom line was this: Charlotte does not have any behavioral or sensory disturbances that affect our daily lives. For instance, she does not throw tantrums that seem unreasonable or surprising. Most of the time, we can identify that she is pitching a fit because she’s hungry or tired, not because she is perpetually disregulated. Considering each of the developmental milestones, we realized that while Charlotte might benefit from the therapy, she didn’t need it. Good thing, too, since Amy is the only certified Floortime therapist in Chicago and doesn’t take our insurance. I didn’t want to trek to the suburbs. So, based on the evidence, we began our search for the right OT practice. Categories: development, DIR Floortime, Occupational therapy | Permalink. Elizabeth referred us to BO&A because she knew that they had therapists trained in therapeutic listening. The name rang a bell and when I did my research, I realized that my friend had taken her autistic daughter to BO&A for years to help with her sensory issues. The clinic is renowned for treating sensory disorders, particularly for children on the autism spectrum. My warning bells rang a bit, but I soldiered on. It took four months to get an appointment at BO&A. The number of phone calls and the length of waiting sounded some more warning bells, but, like Elizabeth, I couldn’t find anyone else in the Chicago area that did therapeutic listening. We began evaluations in November. These consisted of three OT sessions for Charlotte and, finally, a parent session for sharing results. The only time that the only available therapist could see Charlotte was on Wednesday afternoons at 2 p.m. Wednesdays are Charlotte’s half-day at school, so in that respect the timing was nice–no missed school. However, at the time, Charlotte was still napping and this was smack in the middle of nap time. True to her adaptive nature, Charlotte did great for the first two sessions. She performed all the fine motor tests (lots of copying shapes, connecting lines, recognizing differences and circling them), going many pages past what the therapist had planned for her. Charlotte knew that at the end of the small room activities there was a gym awaiting her, complete with a ball pit to dive in. She lived for the ball pit. But, Charlotte had a hard time getting out of the ball pit. Physically at first, yes. But, more importantly, emotionally. Without her nap, she had no control over her emotions and would pitch major fits when it was time to leave. No amount of preparation (“Five more minutes,” or “Two more dives.”) mitigated it well. She would calm down the minute she put on her shoes and got her sticker, but she simply didn’t want to stop doing the activity she loved most. Then, on the day of the third appointment, Charlotte had a temper tantrum in the car on the way there. (Did I mention that BO&A is in Skokie, IL? Usually about a 25-30 minute ride at that time of day.). We were running very early and, rather than waiting in the icky waiting room, I wanted to do a quick errand at the mall. Even tried bribing her with an Auntie Anne’s pretzel. But, Charlotte just wanted to get to that ball pit. I explained that she would have to wait for 45 minutes because the therapist was with another child. She was unrelenting. Finally, I pulled in a parking lot and tried a time out. No change in behavior. So, I called and cancelled the appointment, took her home, put her down for a nap,and enjoyed the three quiet hours. Charlotte really needed her nap, I knew it, and I did what I knew my kid needed. While Charlotte napped, I fielded a call from the OT about the cancellation. Her take was that I should have brought Charlotte in so that she (the OT) could teach me how to deal with Charlotte’s “inability to regulate.” I tried to calmly explain that this extended behavior had been out of the ordinary, but my explanation fell on deaf ears and I got a parenting lecture. We went back the next week and completed the test. Why this digression about one day in the life of the tests? Two reasons: The therapist clearly wasn’t hearing me, on any issue. She held that Wednesday appointment open for us for 4 months (the two it took her to write the report and schedule our follow up and the two months afterword), even after I told her that I likely would look closer to home for treatment. And, worse, she used the incident just described to demonstrate that, in her opinion, Charlotte had serious regulation issues and sensory concerns. We finally got the report in February, after we had gone through neuropsych testing (stay tuned) and before the neuropsych did her report. The bottom line of the OT report? 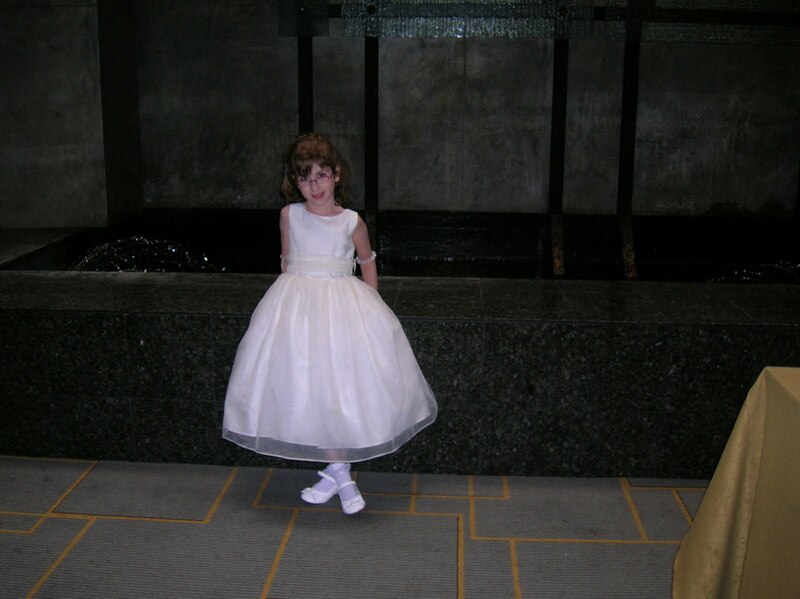 It was a catastrophizing assessment of our child that put her just shy of the autism spectrum, called for weekly OT as well as weekly mental health appointments. She recommend something called Floortime Therapy, which when we researched it seemed somewhat inappropriate for our child. And, she dismissed therapeutic listening in one short sentence. Certainly, she found and assessed the fine motor and shoulder girdle concerns that were holding Charlotte back, but the report didn’t seem to see Charlotte as a typically developing kid. In our in-person session, the therapist was, in my opinion, dismissive of our questions and concerns, recommending that we read a book about parenting a child with sensory disorders. We didn’t dismiss it, of course, but we took it with a grain of salt and some professional assistance. And we sought a different therapy clinic for Charlotte. Needless to say, we were glad to have the neuropsych and our friendly Aunt Denise, a wise pediatric OT, to offer second opinions! This brings our odyssey to February. Stay tuned for the January neuropsych testing, our research into Floortime and wonderful conversations with the Chicago Floortime guru, Amy Zier, and our discovery of Oaktree and Miss Jill. Categories: development, Occupational therapy | Permalink.